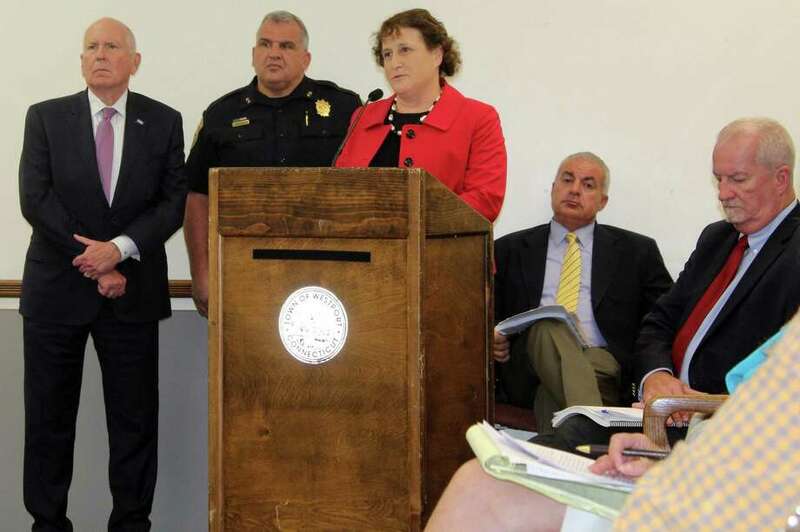 Board of Education Secretary Elaine Whitney spoke in favor of an appropriation for two school resource officers along with First Selectman Jim Marpe, left, and Police Chief Foti Koskinas. WESTPORT — A new funding strategy has emerged in the effort to add police officers to Westport’s middle schools: Pay existing officers with overtime funding to serve as school police instead of hiring new officers for the positions. “We really didn’t like the idea of hiring two new town employees for something that is a new experiment, because when you hire new employees they are subject to a guaranteed pension and retirement benefits,” said Jeff Wieser, chair of the Representative Town Meeting Finance Committee. Wieser’s committee voted in support of funding the middle school officers through an appropriation of $185,000 in overtime pay to the police department at a meeting of the committee on Aug. 2, after Police Chief Foti Koskinas floated the idea to the group in a last-ditch effort to seek funding for two police officers at Westport’s middle schools for the upcoming school year. Together with Superintendent Colleen Palmer and First Selectman Jim Marpe, Koskinas has been a strong proponent of hiring school resource officers for Westport’s schools ever since Palmer first recommended the idea to the Board of Education last fall to protect against gun violence. For the first time, a full-time officer will be on duty at Staples High School this school year after the Board of Finance voted to reappropriate funds for the D.A.R.E. program to hire an SRO for the high school. But the BOF has proved a bulwark against the hiring of two additional SROs — one for each of the town’s middle schools — and twice voted down appropriation requests to hire the officers. On July 11, the BOF voted down a $320,000 request for the officers, and again voted no on Aug. 1 when Marpe and Koskinas, with the support of Palmer, presented a lower appropriation request of $260,000 to the BOF. Frustrated with the BOF’s July’s 11 decision, RTM members Nicole Klein and Andrew Colabella petitioned to overturn the finance board’s original denial to fund the additional SRO’s. The RTM was set to vote on whether to overturn the decision at an RTM meeting scheduled first for Aug. 7, and then moved to Aug. 21. Both meetings have been cancelled, however, because relevant RTM committees, such as the finance committee, needed to recommend to overturn the original proposal in order for the new one to move to the full RTM, Marpe said. “The RTM can take an appropriation request and lower the amount of the appropriation, but can’t change the terms of the appropriation and in effect, that’s what they did,” Marpe said, referring to the new idea to appropriate $185,000 to fund the SROs through overtime pay. The new proposal will likely come before the BOF at the board’s Sept. 5 meeting, Marpe said.